Review: It is very hard not to look at most of these live action re-imaginings of classic animated Disney films of yesteryear as nothing more than cynical cash grabs. For some of these films, you look at them and just think, there is no reason for these films to be remade. 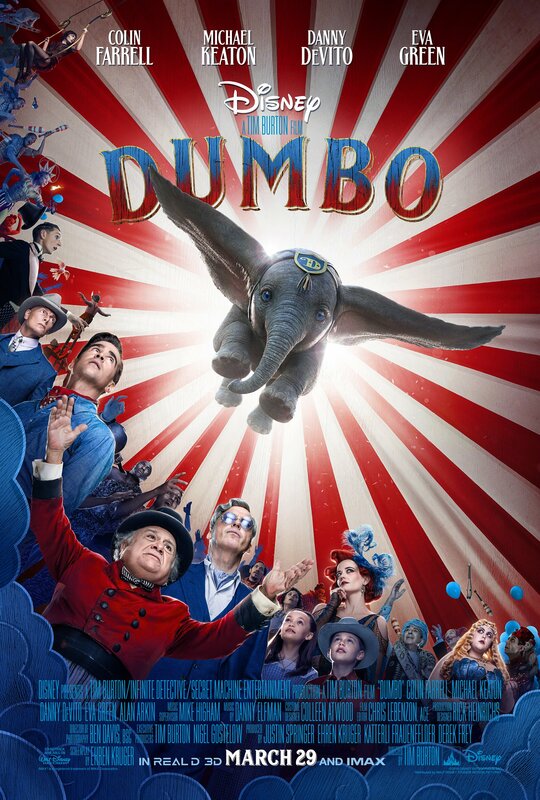 However, in the case of Dumbo, since the original film came out over seventy years ago, a remake does seem warranted. However, with three live action remakes set to grace the big screen this year, Disney is only just getting started, and everyone’s favourite big eared elephant is the first one in its sights. It is 1919, and Holt (Farrell) has just come home from the First World War, a war that has taken a heavy toll on him. In his absence, his kids Millie (Parker) and Joe (Hobbins) have been enduring a difficult time, with their circus, led by Max Medici (DeVito) really falling on hard times. However an opportunity to revive their ailing fortunes presents itself with the arrival of an adorable young elephant, who happens to be born with unusually large ears. Initially the subject of much derision and ridicule, most notably from Medici, this turns to awe when it’s revealed that this young creatures’s ears give him the ability to fly. This soon attracts the attention of V. A. Vandevere (Keaton), the owner of a much bigger circus/theme park. Given that humans didn’t feature in the original, and that the original film was just over an hour, Ehren Kruger’s screenplay has to expand on the source material. As such the human characters become the main focus of the film, and not the titular little elephant. 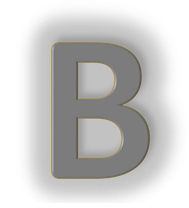 Given that they’re the focus of the plot, the screenplay tries to give the humans something substantial to work with, and the results are mixed. DeVito is on reliably entertaining form as Medici, but it’s Holt’s daughter Millie who steals the spotlight as she is the most fleshed out character. She is a very strong willed young woman who has a keen interest in science, as well as taking care of Dumbo and helping him adapt to circus life, alongside her brother. Parker’s performance shows that she has inherited those acting chops from her mother Thandie Newton. By contrast, none of the other human characters are really given much development, despite some of the stellar names in the cast. Michael Keaton’s character especially feels really out of place, with an accent so peculiar it’s hard to fathom what accent it is or why he’s speaking in that manner. One quick glance at the filmography of Tim Burton, and you would quickly realise that his imagination as a director is as dark and eccentric as they come. With that said, he doesn’t seem to be the most natural choice to bring Dumbo’s story to a new generation. Given the target market of the film, there’s obviously nothing as macabre or as freaky that Burton’s imagination has previously brought to the big screen. Though, as one might expect with Burton, there are some dark undertones. Yet the direction for the most part feels very safe and doesn’t really take any risks, which feels like a missed opportunity as the scope was there to explore a dark side to the circus. 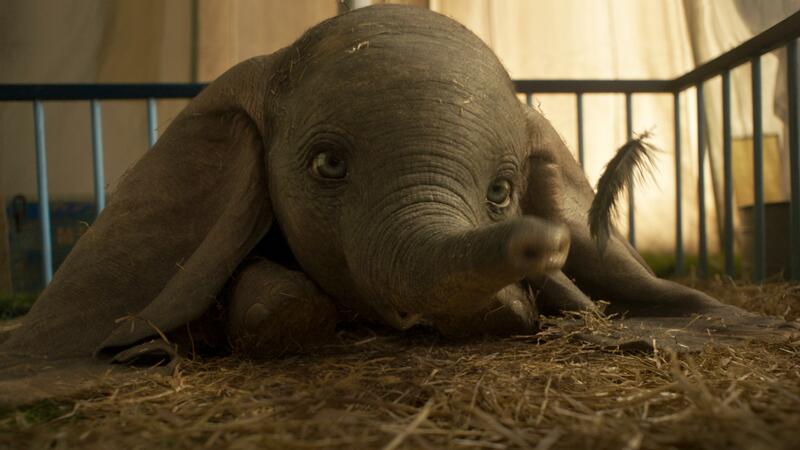 The CGI for Dumbo is really well done and, as you would expect, Dumbo is completely adorable and above all else, in spite of the glittering array of talent in this cast, it’s this sweet little elephant that you find yourself rooting for the most, if only he had that little bit more screen time. The cast try their hardest, but an indifferent script and the mismatch of tones prevent this live action re-imagining from soaring, but, thanks to the adorable titular elephant, it does get off the ground. I really really really wanted to like Dumbo but it was just missing that magic. Great review!